Seeds are the delivery systems for agricultural biotechnology. High quality seed leads to excellent seedling performance in the field. It is the ultimative basis of successful companies that breed crop plants for seed production. Seed quality is a complex trait that is determined by interactions between multiple genetic factors and environmental conditions. Modern approches to improve seed quality therefore combine classical genetics, plant molecular biology and a variety of seed technologies. These "seed biotechnologies" enhance physiological quality, vigor and synchronity to establish a crop in the field under diverse environmental conditions. Seed technologies (seed enhancements, seed treatments) include priming, pelleting, coating, artificial seeds, and other novel seed treatment methods of applied seed biology. Our basic and applied seed research projects focus on embryo growth and on the different seed covering layers (e.g. testa, endosperm, pericarp), which are determinants of seed quality and exhibit the biodiversity of seed structures. Seed germination is controlled by environmental factors (light, temperature, water) and on plant hormones as endogenous regulators (gibberellins, abscisic acid, ethylene, auxin, cytokinins, brassinosteroids). The utilization of plant hormones and inhibitors of their biosynthesis and action in seed treatment technologies affects seed germination and seedling emergence. The genes, enzymes, signaling components and down-stream targets of plant hormones provide molecular marker for seed quality and seedling performance. Seeds of horticultural species like in the image next to this text. Sugar beet fruits, where polishing removes projections of the pericarp/perianth, which is followed by sorting into defined seed size classes. Important methods to enhance seed and seedling performance are through addition of chemicals to protect the seed from pathogens and/or to improve germination. 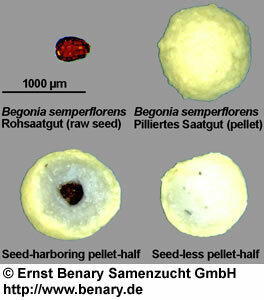 Different techniques of seed coating ('Saatgutbeschichtung') and seed pelleting ('Pillierung') are used for this. The image below shows a film-coated sugar beet fruit (left) and a pelleted plus film-coated sugar beet fruit (right). 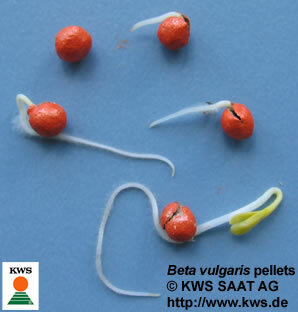 The image on the right shows such film-coated and orange-colored sugar beet pellets of a seed company (© KWS SAAT AG - http://www.kws.de). 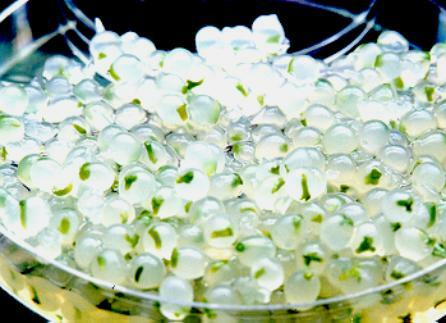 Film-coating methods allow the chemicals to be applied in a synthetic polymer that is sprayed onto the seeds and provide a solid, thin coat covering them. The advantage of the polymers is that they adhere tightly to the seed and prevent loss of active materials like fungicides, nutrients, colorants or plant hormones. Some novel applications of film coating are used to modify imbibition and germination. They can confer temperature-sensitive water permeability to seeds or affect gaseous exchange. By this they control the timing of seed germination and seedling emergence. Certain temperature-dependent water-resistant polymers can delay imbibition until the climatic conditions become suitable for continued seedling growth. Seed pelleting adds thicker artificial coverings to seeds, which can be used to cover irregular seed shapes and add chemicals to the pellet matrix, e.g. of sugar beet or vegetable seeds. The pellet matrix consists of filling materials and glue. Loam, starch, tyllose (cellulose derivative) or polyacrylate/polyacrylamide polymers are commercially used. A film coat can be added onto the pelleting layer as shown in the figure above. 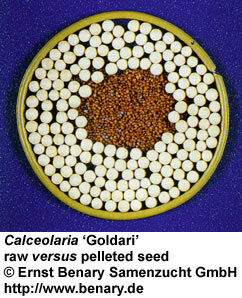 Seed pelleting is also used to increase the size of very small horticultural seeds. This provides improved planting features, e.g. singulate planting, the use of planting machines, or precise placement and visibility in/on the soil. The images below this text are examples for pelleting of very small horticultural seeds. Seed priming is the most important physiological seed enhancement method. Seed priming is an hydration treatment that allows controlled imbibition and induction of the pregerminative metabolism ("activation"), but radicle emergence is prevented. The hydration treatment is stopped before dessication tolerance is lost. An important problem is to stop the priming process in the right moment, this time depends on the species and the seed batch. Molecular marker can be used to control the priming process. Priming solutions can be supplemented with plant hormones or beneficial microorganisms. The seeds can be dried back for storage, distribution and planting. Germination speed and synchronity of primed seeds are enhanced (see figures below) and can be interpreted in the way that priming increases seed vigor (short or no "activation" time). A wider temperature range for germination, release of dormancy and faster emergence of uniform seedlings is achieved. This leads to better crop stands and higher yields. A practical drawback of primed seeds is often a decrease in storability and the need for cool storage temperatures. Osmopriming (osmoconditioning) is the standard priming technique. Seeds are incubated in well aerated solutions with a low water potential, and afterwards washes and dried. The low water potential of the solutions can be achieved by adding osmotica like mannitol, polyethyleneglycol (PEG) or salts like KCl. Hydropriming (drum priming) is achieved by continuous or successive addition of a limited amount of water to the seeds. A drum is used for this purpose and the water can also be applied by humid air. 'On-farm steeping' is the cheep and useful technique that is practized by incubating seeds (cereals, legumes) for a limited time in warm water. Matrixpriming (matriconditioning) is the incubation of seeds in a solid, insoluble matrix (vermiculite, diatomaceous earth, cross-linked highly water-absorbent polymers) with a limited amount of water. This method confers a slow imbibition. Pregerminated seeds is only possible with a few species. In contrast to normal priming, seeds are allowed to perform radicle protrusion. This is followed by sorting for specific stages, a treatment that reinduces dessication tolerance, and drying. The use of pregerminated seeds causes rapid and uniform seedling development. Cell culture and regeneration techniques allow the mass production of somatic embryos. This can be used to generate genetically identical seedlings of poplar, orchids and other species. Somatic embryos can be packed in a suitable gel-type matrix (agar-agar, gums, dextrans) and covered with an artificial seed coat. These artificial seeds provide an important packaging system. Figure from "Artificial Plant Seed Production - Singapore Polytechnic School of Chemical & Life Sciences - © Wendy Shu (Lecturer, School of Chemical & Life Sciences)"
The concept of using plants as hosts for the production of valuable proteins has been called "molocular farming". A wide range of pharmacologically interesting proteins can be expressed in diverse plant organs. A very interesting possibility is to use seeds as a host for molecular farming. This has as an advantage that these transgenic seeds harboring the protein of interest can be stored in the dry state for a long time and the integrity of the pharmacologically interesting protein is kept. Modified seed storage proteins or modified oleosin proteins have been used for this purpose. Seed-specific gene expression is being exploited in applications including the production of proteins of pharmaceutical or industrial interest in seeds. A very interesting technology is based on the genetic manipulation or physical manipulation of plant seed oilbodies (Brassica, Arabidopsis). Oilbodies are protein-coated lipospheres that naturally form in plant seeds to function in triglyceride (oil) storage. The lab of Maurice M. Moloney (University of Calgary, Canada) has performed interesting research on this. Several reviews of M. Moloney (see below) describe these approaches and can be found on his lab website. The company SemBioSys Genetics Inc. has developed proprietary technologies based on both transgenic and non-transgenic oilbodies. The transgenic technology is based on the genetic engineering of oilbodies and oilbody-associated proteins, or oleosins. The company website offers information about the technology and publications related to it. Moloney MM (2002). Plant molecular farming: using oleosin partitioning technology in oilseeds. In: Plants as Factories for Protein Production. (eds. Hood E, Howard J). Kluwer Academic Publishers, Dordrecht, The Netherlands, pp. 55-75. Seon JH, Szarka SJ, Moloney MM (2002). A unique strategy for recovering recombinant proteins from molecular farming: affinity capture on engineered oilbodies. J. Plant Biotechnology 4: 95-101. Moloney MM (2000). Molecular farming using seeds as hosts. 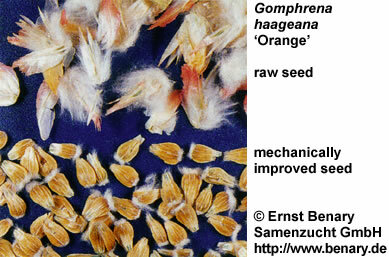 In: Seed Technology and its Biological Basis. Sheffield Academic Press, pp. 226-256. Halmer, P. (2004). Methods to improve seed performance in the field. In: Handbook of seed physiology (eds Benech-Arnold, R.L. and Sanchez, R.A.). Food Products Press, The Harworth Press, Inc., New York. Bradford KJ and Bewley JD (2002). Seeds: Biology, Technology and Role in Agriculture. Chapter 9 (pp. 210-239) in: Plants, Genes and Crop Biotechnology (eds Chrispeels MJ and Sadava DE), 2nd Edition, Jones and Bartlett, Boston. Copeland LOand McDonald, MB (2001). Principles of Seed Science and Technology. Kluwer Academic Publishers, Dordrecht, The Netherlands. Cyr DR (2000). Seed substitutes from the laboratory. In: Seed technology and its biological basis (eds Black M and Bewley JD). CRC Press LLC, Boca Raton, FL, U.S.A.
McDonald MB (2000). Seed priming. In: Seed technology and its biological basis (eds Black M and Bewley JD). CRC Press LLC, Boca Raton, FL, U.S.A.
Suprasanna P, Ganapathi TR, Bapat VA (2006). Synthetic seed technology. In: Handbook of seed science and technology (ed Basra AS). Food Products Press, The Harworth Press, Inc., New York. Elias S (2006). Seed quality testing. In: Handbook of seed science and technology (ed Basra AS). Food Products Press, The Harworth Press, Inc., New York. Powell AA (2006). Seed vigor and its assessment. In: Handbook of seed science and technology (ed Basra AS). Food Products Press, The Harworth Press, Inc., New York. Doijode SD (2006). Seed quality in vegetable crops. In: Handbook of seed science and technology (ed Basra AS). Food Products Press, The Harworth Press, Inc., New York.